Check your Inbox for an activation email and click the green button. Submit the completed online form. 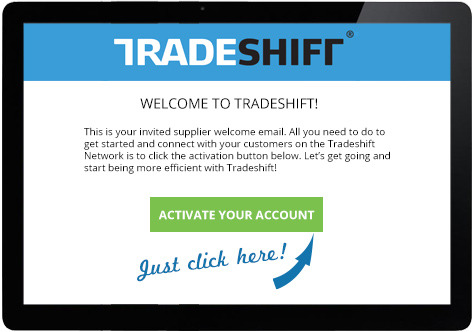 You will receive an activation email from Tradeshift with a link which will allow you to set your account password. Using the link in the email set your password. You are now logged in to your Tradeshift account! After completing Step 1, you should be connected with your customer. Once in your account, you can have an overview of your connections from the "Network" tab in the sidebar. Connection requests also appear inside the Tradeshift web application and can be accepted from there. Click here to learn about connecting to your other customers through Tradeshift. There are several ways to upload invoices to Tradeshift. If you are only sending a small number of invoices, the web portal may be your best option. However, you can achieve greater degree of automation by integrating with Tradeshift directly. Document Uploader - “Document Uploader” app accepts a wide variety of invoice file formats generated by business accounting software, including PDFs. File Transfer - Popular transfer protocols like SFTP or FTPS are a simple way to transfer your invoices to your account on Tradeshift. API unlocks the full functionality of Tradeshift. 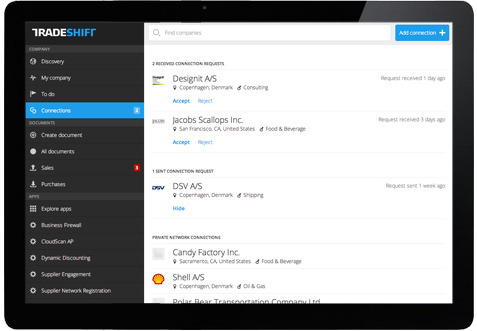 Tradeshift supports a wide range of formats. If your accounting software exports invoices in one of the Tradeshift-supported formats, you can upload them to Tradeshift for free without having to change the original format. A readme file with a short introduction to mapping. A master spreadsheet defining Tradeshift canonical business elements, business descriptions, code lists, etc. The format-specific spreadsheet defining the mapping from the specific format to the canonical business elements. A set of example files with comments. The business rules and other requirements that are necessary to invoice your customer can be found on that customer's dedicated Support Landing Page.